All stocks have at least 5 years of dividend growth history. A dip to 11 from 20 last week. 5 have at least a 10% increase including one 40% increase. I love stocks that grow their dividends year in and out. You probably do too! If so, you are in the right place. I've created a list of stocks that are increasing their dividend next week. The information presented below was created by combining the "U.S. Dividend Champion" spreadsheet hosted here, with upcoming dividend information from Nasdaq. This meshes metrics about companies with dividend growth history with upcoming dividend payments (and whether those payments are increasing). These companies all have a minimum 5-year dividend growth history. Dividend increases are one of the most outward signs by management as to how business is going. Dividend yields also don't live in isolation; share prices tend to follow increases, as investors will move into a stock to claim the new payments. All else being equal, a 10% dividend hike should see an approximately 10% share price appreciation over time as the market adjusts to the higher payment. This produces a great flywheel effect whereby an investor can increase their income and see the face value of their investment increase. I received a comment about including the pay amount, I plan on including it, but it didn't make it for this week. Some investors are more interested in current yield, so this table is sorted descending by yield. This also includes some of the historical dividend growth rates as a bonus. Additionally, the "Chowder Rule" has been included (the current yield + 5-year dividend growth rate). That is the current yield plus the 5-year dividend growth rate. 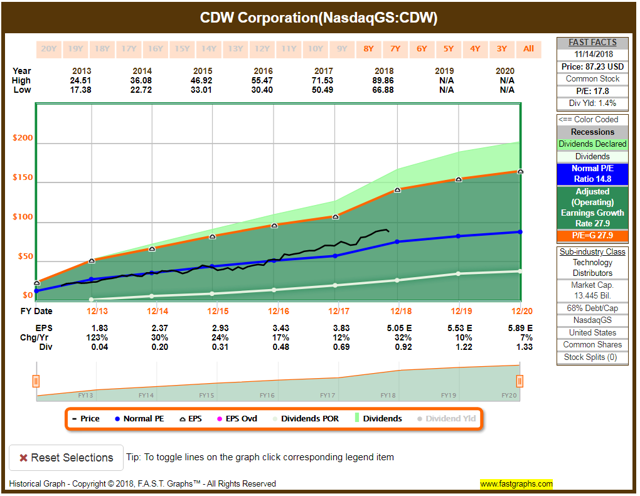 Due to such a crazy increase, I have to highlight CDW today. It's only been public for 5 years but has been an earnings growth monster story. What's funny is though earnings growth has averaged 28% a year, the stock only trades at about 18x earnings. Based on analyst expectations, it looks like growth is expected to drop off the next few years. 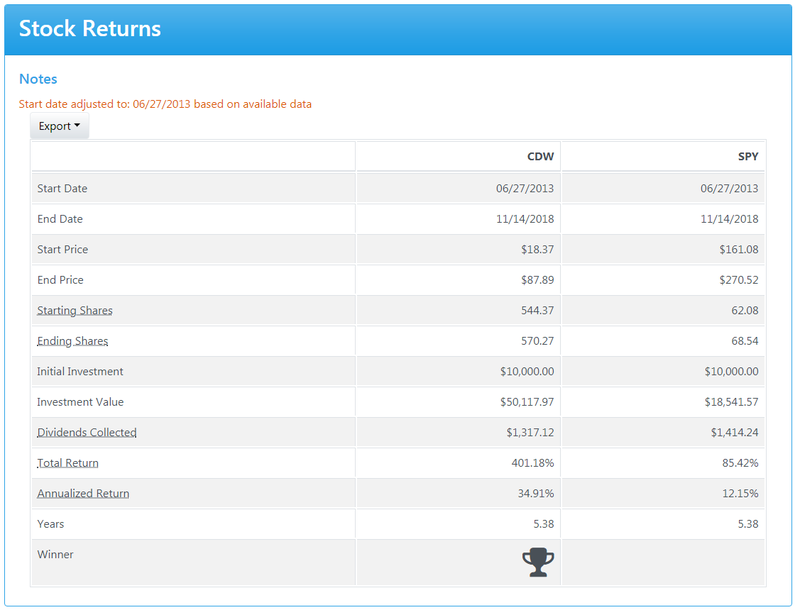 The payout ratio is still quite low, which means this one has a lot of room to run in the future. Don't consider this a recommendation; do your own due diligence. Running a stock return calculation versus the S&P since their IPO in 2013, shares have crushed the market with about a 35% annual return versus 12%. Your yield on cost from inception would also be close to 4%. Over the stretch of time, it has always beaten the market even with a recent pullback.